5 Best Air Pistols: Which One Is Right for You? Home » 5 Best Air Pistols: Which One Is Right for You? Choosing an air pistol for target shooting, plinking, or small game hunting should not be a split second decision. You should not just select the first gun that catches your fancy. The four air pistols discussed below are the best of the best. Each has been tried and tested by numerous people for quality and performance. Use this information to help purchase the best air pistol for you. You know straight off the bat that you are going to get only the highest in quality when you shop from a respected brand like Benjamin. Their Marauder is a .22 caliber PCP (pre-charged pneumatic) air pistol that is perfect for those interested in small game hunting. Pull the Benjamin Marauder Air Pistol from its packaging and the first thing you will notice is its size. This baby is big. It includes a fixed shoulder stock that has the ability to turn into a carbine. Part of the reason for the Marauder’s size is its PCP propulsion method. The air pressure tube capacity needed to provide a reasonable number of shots and power on a PCP air pistol makes constructing a conventionally sized pistol very difficult. Thus the Marauder’s slightly larger than pistol size. However, in many ways, this added size makes the gun an even better performer. Accurate, powerful, and quiet are just a few ways to describe the Marauder Air Pistol. If you have a history with air guns, you might have had a chance to shoot the Benjamin Marauder Air Rifle. While the pistol version of the Marauder shoots much like its big brother, it is not quiet as quiet. But we all know that quietness isn’t the sole mark of a great air pistol. For most, power ranks right up there as one of the most important features. And, man, is the Marauder Air Pistol powerful. Up to 700fps is possible, making the gun perfect for pest control. An eight shot magazine makes a follow up shot easy. Power is nothing without accuracy. If you can’t hit your target, then what is the point of all that energy? Benjamin takes this wisdom to heart and the Marauder is one accurate air pistol. Of course, it takes a little getting used to (like any new gun), but after a short break in period, you can expect to have a solid shot. Purchasing an air gun scope alongside your Marauder Air Pistol is essential in my opinion. It increases accuracy at both short and long range. The Benjamin Marauder Air Pistol is a great air gun for anyone from the average hobbyist to a homeowner seeking frontline small pest control. As mentioned earlier, it is one of the best air pistols on the market for serious small game hunters. The only group this gun probably isn’t well suited for is children because of its high price and somewhat more complex operation. Solid firepower at an affordable price is the name of the game for the .177 Crosman American Classic Pump Air Pistol. It is the perfect gun for those that want something that will get the job done without breaking the bank. About 600fps after 10 pumps produces much more firepower than nearly any other comparable air pistol on the market. Accuracy is another high point for this Crosman air pistol. It’s ambidextrous grip makes it easy to use for both left handed and right handed shooters. A choice between a traditional notch rear sight and an aperture sight gives you the ability to shoot the way you are most comfortable. Switching between the two different types of sights is easy. Adding a mounted air gun scope or red dot sight makes this air pistol even more accurate. Overall, the Crosman American Classic .177 Air Pistol is one of the best air pistols for its price tag. It features selectable power (based on the amount of pumps used) and an out of the box choice of a fully adjustable aperture or notch sight. 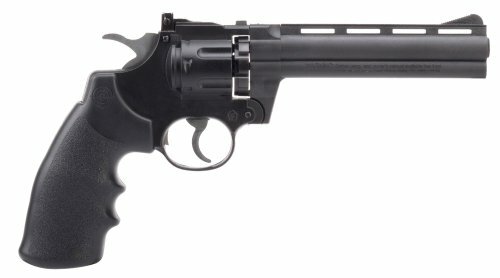 When it comes to talking about the best air pistols on the market, you would do well not to leave the Benjamin Trail .177 NP Break Barrel Air Pistol out of the conversation. The air gun combines classic good looks with solid firepower (625fps with alloy pellets), reliable accuracy, and a good price (check out the discounted price on Amazon). It is perfect for new shooters, beginners, and those interested in backyard plinking. One of the highlights of the Benjamin Trail Air Pistol is definitely its accuracy. After a short learning period, experienced shooters will be able to put 9 out of 10 shots into a 2-inch target from around 20 yards away. Unlike many other similarly priced air pistols on the market, the Trail features a very small number of “flyers”. As a break barrel style air pistol, the Benjamin Trail holds up well. The barrel pivot screw fits tight. There is no side play during use that might affect accuracy. This in itself makes the air pistol stick out from its competitors, as the actual pivot screw of many break barrel air pistols is an overlooked feature. The air pistol features a comfortable and solid synthetic stock with an intuitive feel. Though the gun’s nose is slightly heavy, the comfort of the grip itself displaces much of this awkwardness. At the end of the day, the Benjamin Trail .177 Break Barrel Air Pistol is a good enough air pistol in its stock form. What really transforms it into one of the best air pistols around is adding a great dot scope. A dot scope greatly improves the accuracy of the gun. If you’re looking for a cheap air pistol, then the Benjamin Trail is for you. Yet cheap here only means price not performance. This air pistol stands up to and outshines nearly every similar gun in its class. Wow. That’s really the only thing to say about the Crosman 3576 Semi-Auto CO2 Powered Pellet Revolver. For one of the cheapest air pistols you can find, the gun has outstanding accuracy. It’s easy to be skeptical about an air gun as cheaply priced as this one – but don’t be. You’ll get much more than you expect when you unwrap the Crosman Semi-Auto Air Pistol and test it out for the first time. With a nice hefty weight to it and a durable construction, the air pistol has a comfortable and intuitive feel in the hands. 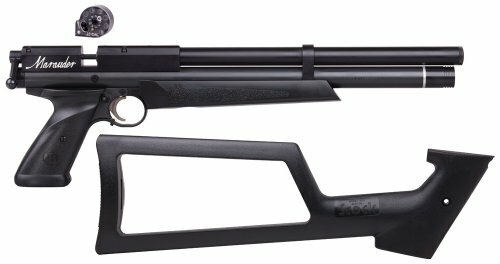 Its remarkable accuracy and reasonable fps (about 420) make it the perfect gun for plinking (one of my favorite air gun activities). A few other features of this Crosman air pistol that are worth noting include its ability to hold 10 pellets, its adjustable sights, and its mounted rail for sights and red dot lights. It’s not a quiet gun by any means but its nice, loud bang after each shot doesn’t really have any effect on the quality of the plinking experience – in fact, I kind of like the sound effects. There is no one best air pistol for everyone. You should select your gun depending on your age, experience level, and personal preferences. The four air pistols discussed and reviewed above truly are the best of the best. They each have their own area of expertise and price point (generally, the more you spend, the higher quality you get). At the end of the day, few things are more fun than shooting an air pistol. Any one of these best air pistols will get the job done and is sure to leave a smile on your face.